Medical tourism; Law and legislation. Medical tourism; Moral and ethical aspects. Amazon.com description: Product Description: Can your employer require you to travel to India for a hip replacement as a condition of insurance coverage? If injury results, can you sue the doctor, hospital or insurer for medical malpractice in the country where you live? Can a country prohibit its citizens from helping a relative travel to Switzerland for assisted suicide? What about travel for abortion? 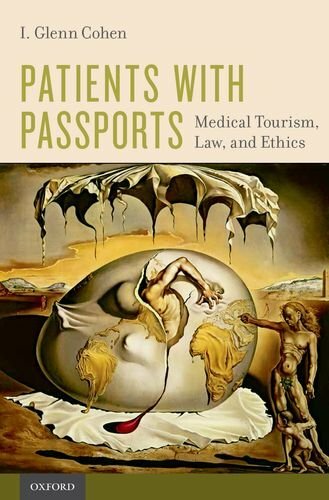 In Patients with Passports, I. Glenn Cohen tackles these important questions, and provides the first comprehensive legal and ethical analysis of medical tourism. Medical tourism is a growing multi-billion dollar industry involving millions of patients who travel abroad each year to get health care. Some seek legitimate services like hip replacements and travel to avoid queues, save money, or because their insurer has given them an incentive to do so. Others seek to circumvent prohibitions on accessing services at home and go abroad to receive abortions, assisted suicide, commercial surrogacy, or experimental stem cell treatments. In this book, author I. Glenn Cohen focuses on patients traveling for cardiac bypass and other legal services to places like India, Thailand, and Mexico, and analyzes issues of quality of care, disease transmission, liability, private and public health insurance, and the effects of this trade on foreign health care systems. He goes on to examine medical tourism for services illegal in the patient's home country, such as organ purchase, abortion, assisted suicide, fertility services, and experimental stem cell treatments. Here, Cohen examines issues such as extraterritorial criminalization, exploitation, immigration, and the protection of children. Through compelling narratives, expert data, and industry explanations Patients with Passports enables the reader to connect with the most prevalent legal and ethical issues facing medical tourism today. About: Can your employer require you to travel to India for a hip replacement as a condition of insurance coverage?